The original way how WordPress sizes the tags in the tag cloud is a bit bad: if you have one tag that is used a lot, e.g. for every post, it makes all other tags too small to have any variance when compared to other less popular tags. I changed the way WordPress determines the size, get the patch here. It is also possible to define your own scaling algorithm, see the patch for more information. Seen is a WordPress plugin that shows when and which bots visit your blog. This can be useful to see if a page ever gets visited by bots (so you can adjust robots.txt or so) or simply to amuse yourself if you are obsessed with what is happening with your blog (everyone knows you are). Additionally, you can get a better understanding of how fast a page gets indexed by search engines and how fast it gets reindexed after you have modified the page. I found it interesting to note what’s the general strategy of different bots, now I know Yahoo really keeps visiting the pages and GoogleBot just very rarely visits older pages (but indexes new pages really quickly). The plugin uses some simple heuristics to decide if a visiting user agent is a bot and puts it in a list of suspected bots (along with data of which pages it visited and when). You can then remove all the user agents that are not bots. Basically, This means you don’t need to manually add any bots at all, you simply weed out the false alerts. Of course, you can explicitly specify bots by their user agent string or host address. After installing the plugin (extract the zip file in wp-content/plugins/ and activate the plugin) data will be automatically recorded. You can monitor what is happening directly from on the Dashboard (there will be two new widgets, a list of bots on the watchlist and a list of unindexed pages). Also, if you go to Dashboard > Seen you can see more detailed lists and also the suspected bots list. I think it’s all quite self-explaining. Hint: you can click the star to add bots to the watchlist — clicking the yellow star will remove them. In the options you can combine bots (i.e. when two or more entries have a differing user agent string but really are the same bot), delete them and edit them. The different categories are there so you can e.g. put Technorati bot in “Search engine (blogs)” which makes Seen not care if the bot has seen the latest comments. You can also categorize bots as “Browser” which means their data will be hidden as it probably won’t interest you. Note: This is not yet 1.0 quality but it should work OK. By downloading and installing the plugin, you acknowledge no responsibility lays on the plugin author. It only occured to me yesterday that there’s a clear benefit in that I bought a new LCD screen a while ago. I leaned on the screen and realized the screen of course rotates 90 degrees flipping the vertical and horizontal axes. Well, this is nothing new and I knew that was popular back in the days when screens were so small that there was a bona-fide benefit in a tilted screen: you could fit a preview of a A4 document on the screen with realistic dimensions. I don’t do design work on my computer. 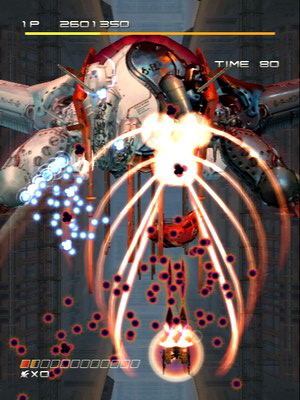 But, for me realizing that old feature was a revelation: it allows playing vertically scrolling shmups properly. I it never occured to me that you could do that even though I knew some people simply tilted their TV sets on their sides (which could be harmful). Long story short, I can be stupid and most importantly: Ikaruga kicks rear. It’s barely playable on Chankast (the better Sega Dreamcast emulator out there, which is not saying a lot) but the game is so awesome that who cares. It’s quite hard in any case, some invisible sprites hardly make it any harder. Everyone and their mother knows Ikaruga is the best thing out there etc. but it also occured to me just yesterday only four people are responsible of creating it. Similarly, the game is only about 20 megabytes in size and even the game mechanics are very simple even for a late 1980s shmup (no power-ups whatsoever). It’s somehow very reassuring for the bedroom game maker. It’s a real shame the game isn’t available on the PC (it should be available for that Xbox Live Arcade thing this April — maybe that gives hope it could eventually find its way to the remaining few). Here’s a macro plugin for WordPress I made. It features useful features for advertising, e.g. limiting the maximum amount of displayed ads. A macro is a bit of text inside a post that, when displayed, will be substituted with other text. It simplifies editing of post and also provides a convenient way to insert repeating content. The macro looks like the above code when editing the post but when viewing the post (or page) it will be substituted with a Google Adsense advert (given that you have defined the macro). Parameters can be used inside macros as follows. The first example is the text inside a post and the second is the macro defined on the Macross options page (with the name “image_with_caption”). This macro will insert the text “A photo I took last summer” as the alt attribute for the tag and add it as a caption below the image. By cleverly using macro priority (a lower priority macro gets injected first) you can use macros inside other macros. In combination with macro display options (i.e. if the macro is enabled for content, excerpts or feeds) you can use the same macro to expand into different text depending on where it is used. Unzip the contents of macross.zip in your WordPress plugin directory and activate the plugin from Options > Plugins. Go to Options > Macross to create a macros. Counters work so that each successive macro injection increments the counter. If any of the specified counters for a macro exceeds the maximum value, the macro simply will not epand (also, none of the counters will be incremented). The checkboxes next to a macro specify on which pages the macro will work. The first colum (Hook) tells Macross whether to expand the macro when actions the_content() or the_excerpt() is called. The third option enables the macro for the expand_macro() function. The rest of the checkboxes specify a page type, as returned by is_page(), is_single() and other conditional WordPress tags. Here’s a very simple plugin for WordPress that keeps track of view counts of individual pages. It is not intended to be a complete statistics solution. Rather, the main purpose is to provide something for those empty spots in your site layout. For a better example, see the site stats page. Copy viewcount.php in /wp-content/plugins and enable it in WordPress options. Enter the path of the directory you want to the graph cache to be located in the options page (Options > Viewcount). The plugin will then start counting page views. Note: the plugin taps into the_content(). Pages that do not use it will not update the stats! See below for a workaround. To display statistics, there are a few functions. get_view_histogram() returns a URL to a PNG image. If $page is unset or is -1, the data will be the combined page views for all pages. $web20 specifies the height of a “Web 2.0” style reflection under the bars. The rest of the parameters should be easy enough to figure out. You can also display a top list of page views with get_view_count_list(). $excludeid is a comma-separated list of post IDs (note:the list is not escaped so do not use any values in there that come straight off $_GET or so!). $type is either “post” or “page”, empty string returns both. To display a Popularity Contest style percentage (the percentage of traffic a post has compared to other posts), use get_popularity($page=-1,$days=30,$format=’percent’). if $page equals to -1, the current page ID will be used automatically. $format can be either ‘percent‘ or ‘float‘ — ‘percent‘ returns a string with the percent sign, ‘float‘ returns a floating point number between 0.0 and 1.0. The following will display a percentage of page views for the current page during the last 30 days. This will display all time statistics, unless your blog has been online for more than 274 years. To get the list of most viewed pages, use the function get_top_pages($days=30,$limit=10,$type=’views’). $type is either ‘views’ or ‘popularity’. You can request more functions! You need the GD library installed for PHP. I created the plugin to see how that is done. Therefore, crap code ensues (see the warning about excluding posts above). The plugin will count views for pages and single posts only. Page views from users who are logged in (e.g. you) will not be logged. The plugin taps into the_content() to count views. You can use vc_update_counter($id) to manually update the page views (or, you can be creative and count very different stuff with it – just make sure the ID is not in use by real pages). In case you think the graph is wrong: the bar height is normalized. This is just so there is interesting variation in the height.